Nokia Tablet Imminent? 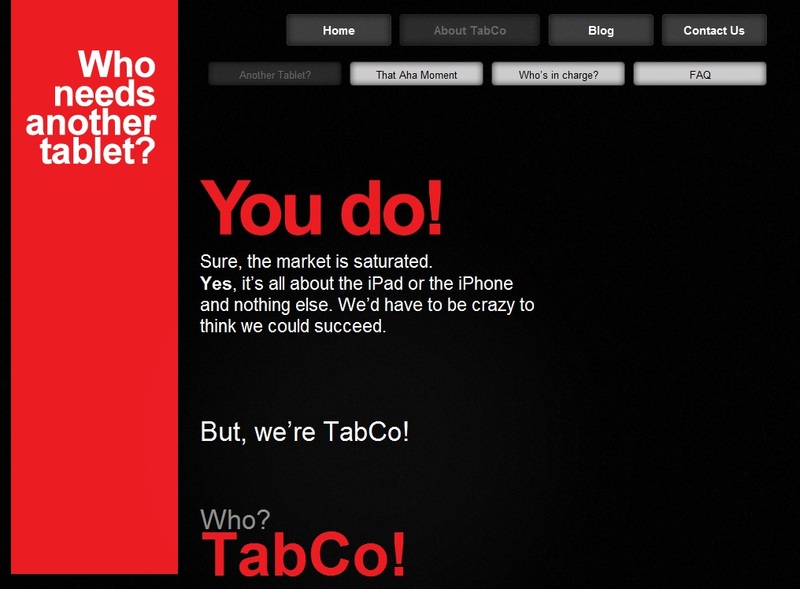 Tabco presents…not just another tablet. Someone tipped us info that will be presented in this post yesterday, but since twitter wouldn’t find the account they mentioned, I just dismissed it. 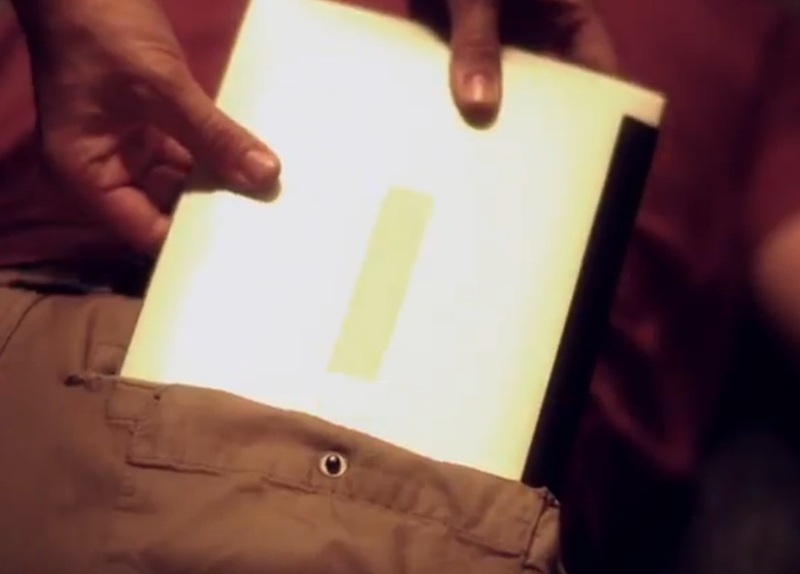 We got the tip again, this time via crisscross who points us to a VERY interesting video. Lots of techy-geek references there. Now do you remember the disappearance of the account WeAreMeeGo? It may just be a coincidence, but some popular MeeGo folk follow that account too (and this is just from the small selection of who I follow, there are probably more). It might not be Nokia at all. There’s equally huge likelihood of us following similar non-Nokia related things. It all seems to be a very clever, very elaborate viral campaign. Not unlike stunts Nokia would pull before. If you have an ounce of fun in you you might find it entertaining. Focus group and their tablets. Listen how they discuss all the competition. iPad, MS laptops, PadFone (OOH listen to the dig on their CEO), Xoom and all the other android tablets. Darn I hope this isn’t HP. ‘i’ve researched tablets and honestly this is entirely different’ <<Well HP WebOS tablet and BB Playbook tablets are NOT entirely different to all the other tablets. Guy goes to rip of the name tag of who makes it. It’s a little bit long for HP. This video has subtitles in multiple languages. It’s NOT any of the Androids. Ah, I do love a good mystery. Cheers for the tip, crisscross and others I’ve missed. Oh, one last thing. Who is the guy who doesn’t want just another tablet? He says there’s really one properly successful tablet, right? The iPad. Everything else? Just another forgetable 201st tablet? Who said that? Oh that’s right, Nokia’s Stephen Elop. Wouldn’t it be easier just to launch the product normally instead of going through all this marketing hoopla? Well, sure, but then we would have a bunch of time left over prior to our launch and who knows what trouble we’d get in then! 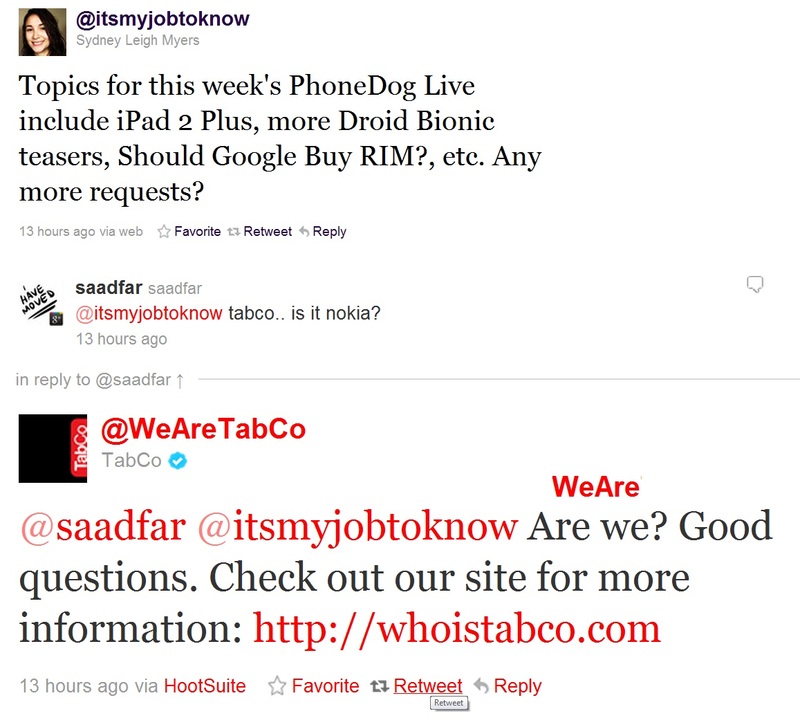 When will TabCo launch its product? Why are you launching a tablet? Isn’t that kind of a stupid move when the market is saturated? OK, what makes it so darn special? A lot of things. The UI, for one is like nothing else out there. It is predictive and draws its inspiration from the semantic web. The desktop is different, almost a canvas that gives you extensive flexibility to organize your life and work. I could go on but my marketing people would be pissed. How much will the TabCo tablet cost? It will cost you less than a bottle of 2010 Bordeaux from a first growth producer. What kind of OS are you running on? An Aha! OS. We think you’ll like it.